(The Pavement, 22 May 2009) In recent months, The Pavement has reported on the various enforcement measures being employed to drive homeless people off the streets. But do such tactics actually work and if so, who benefits? These are the questions asked by a report, published last year, which examines the impact of enforcement on ‘street users’ in England. The study, carried out by Sarah Johnsen and Suzanne Fitzpatrick, of the University of York, and published by the Joseph Rowntree Foundation, is primarily concerned with measures used to tackle begging, street drinking and other examples of what is often referred to as “problematic street culture”. However, it also refers to enforcement initiatives used against rough sleepers. The examples of enforcement cited in the report will sadly be familiar to many readers: dispersal orders, the closing down of rough sleeper ‘hot spots’, ‘hot washing’ (wetting the streets to discourage rough sleeping) and arrests under the 1842 Vagrancy Act. The report examines how these interventions have been used and their impact in five key areas – Westminster, Southwark, Birmingham, Leeds and Brighton. From the research carried out, the report concludes that “enforcement is a high-risk strategy, only to be used as a last resort, and never with very vulnerable street users, such as those with mental health problems”. Yet, the report also suggests that many local authorities are increasingly keen to employ these measures in what they see as the “fight against rough sleeping”. The Pavement recently reported the arrest of Peter Pickles, amongst others, who refused to be ‘moved on’ (issue 33). The incident shocked many people and pointed to a new tough approach by the authorities. This arrest may have been less shocking in Leeds, however, where according to the report homeless people have been arrested under the 1824 Vagrancy Act simply for sleeping rough, a policy carried out, the report claims, in order to “disrupt street lifestyles and address associated ASB”. Arrests as a tactic was not used in any of the other case studies areas. This was, says Dr Johnsen, for a variety of reasons. “The first one being that the police don’t actually want to arrest people who sleep rough. That’s not what they’re about,” she says. “Secondly, there’s a significant fear of public backlash, because while a lot of members of the public – certainly the ones we spoke to – approve of the use of enforcement for people who are begging aggressively or are ‘agro’ street drinkers, most have a very different opinion when it comes to people who are ‘just’ sleeping rough.” “The other reason,” Dr Johnsen explains, “is because it would be of questionable legality in a lot of places, as people can only be arrested if they have refused the offer of ‘freely available’ accommodation. In somewhere like London, you cannot say ‘here’s a bed space available to you right now’ because it just doesn’t happen that way. There’s a real process people have to go through in order to get into a hostel, red tape that has to be negotiated, hoops they have to jump through… It doesn’t happen instantly.” Although the report found instances where arrests acted as a “constructive ‘kick'”, motivating a minority of rough sleepers to look for accommodation, rough sleepers generally just avoided arrest by bedding down further away from the city centre in more hidden places. Most support providers, as well as members of the wider community who were interviewed, were opposed to the arrest of rough sleepers. Although dispersal orders had been considered in a few case studies, they have not been used to any great extent. While in theory they would help break up large groups of street users, there were concerns that dispersal orders would simply shift street activity to another area. Closing rough sleeping hot spots was thought to be a more effective lever to encourage entrenched street users into services, by both enforcement agents and frontline workers. Used most commonly in central London, as well as Birmingham and elsewhere, one Westminster frontline worker in the report agreed. “If an area is disrupted then it might budge someone in their pattern of going to the same place, at the same time. If they can no longer do that it may make them look at something else,” the worker said. But they emphasised a need for “appropriate interagency coordination” and giving “plenty of warning regarding the date of closure and information about support options available”. They also called for eventual closure to be preceded by intensive outreach work. Many support providers who were interviewed supported the enforcement measures in principle, provided there was coordination with supportive interventions. However, street outreach workers agreed almost unanimously that enforcement measures caused many rough sleepers to “go underground” and sleep in more hidden places, making them harder to locate and offer support to. Frontline staff also objected to the use of enforcement to combat anything but “genuine” antisocial behaviour. Many support providers were also worried that councils were under pressure to “be seen” to take action against antisocial behaviour, with their clients viewed as “easy targets”. Following the reports of harassment of rough sleepers in the City, many people expressed feelings of unease and even anger towards Broadway, the charity contracted by the Corporation of London to carry out homeless outreach work within the Square Mile. “It’s really important that outreach workers aren’t implicated in enforcement actions because they lose their integrity in the eyes of people on the streets,” Dr Johnsen warns. While outreach workers in the report were anxious to distance themselves personally from enforcement, frontline workers wanted a “seat at the table” in antisocial behaviour operational discussions, in order to safeguard the interests of their clients. Like many service providers, those homeless interviewed were often cynical about the motive behind the enforcement initiatives. “What are the authorities actually after? Is it a vanity, a cosmetic exercise? 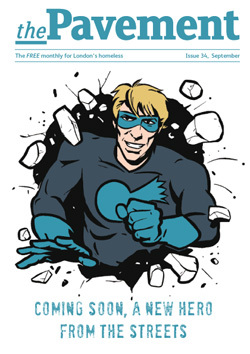 Do they think we should be out of the way of the visitors?” asked one rough sleeper in Westminster quoted in the report. Not all those interviewed were completely against enforcement tactics for “aggressive” individuals. However, the report notes: “street users on the whole believed that they should be ‘left alone'”. What’s the future for enforcement? “There’s [already] been a significant change in perception amongst service providers” said Dr Johnsen. “Since we first began the research people seem to have come to a consensus that enforcement can in some circumstances help some people, but only if appropriate support is effectively integrated, and even then you can’t guarantee that it will work for any one individual.” But, there are still gaps in the provision of some services, she adds. “It’s all very well saying to these people ‘you need to change your way of life, you need to come inside, live in a hostel, you need to get drug or alcohol treatment’ and so on. But if you can’t offer it to them then and there, how justifiable is the threat of dire ramifications for failure to engage?” A major concern for many when reading about these moves will be the loss of free will it marks for readers, as they dictate how and where one should live – instead of relying on an offer of an alternative to life on the street, they are attempts to ban it. Broadway has made much of its statement that “we do not believe it is acceptable that anyone in the 21st century should have to sleep on the streets”. The question perhaps to ask now, some suggest is, ‘acceptable for whom?’. See letters for more on the City story and a legal query.